Words like “Vitalism,” “Matter,” “Force,” and “Intelligence” have been the foundational core tenants of the Chiropractic profession since D.D. Palmer. That first D.D. adjustment of Harvey Lillard redirected health 120 years ago. The outcome of that 1st adjustment sparked a new way of restoring better function through structural change and a phenomenon of ‘a bone out of place’. This new perspective of a ‘subluxation’ being a root cause of health has engaged thousands of chiropractors to investigate the perfect correction of a ‘bone out of place’. This pilgrimage has produced many phenomenal vantage points of moving one bone… one bone at a time back into place. The chiropractic craft is based on a philosophy of inside-out health and the empowering self. Through an adjustment, balance is restored to our physical and energetic essence. This is based in the 33 principles that connect Innate Intelligence (man) with Universal Intelligence (energy). This philosophy of ‘Vitalism Balance’ or contemporary organicism is ‘our root philosophy’. Chiropractic philosophy roots are one of synergy and energy yet our approach is structural and boney. Is there balance? Chiropractic’s largest growth in its science was between 1910-1975. Different methodologies and different models of the bone out place emerged. It was a time of creativity and growth. Chiropractic schools curriculum is steeped in these methods. B.J. Palmer was the pioneer that focused on this concept of a specific the bone out of place. His investigation tagged C1 and C2 the ‘Major and Minor’ and was the first to look at the functional health effects at the brain stem and the relationship to the C1 ‘Atlas’. His view was ‘structure dictated function’ as the path to restore health. While B.J. looked neurological, Clarence Gonstead focused on structural Biomechanics and the foundation theory. Even though each had different perspectives, their approach was to move the bone out of place into place. Both pre checked with an x-ray for alignment bust both used a heat device as a functional measure for results. Is this in balance? Other techniques have examined adjuncts of these philosophies. Curves, extremities, inter-relationships, tree of life, energy, spinous-rotation, and head translation, are a random few of the thousands that have grown out the bone out of place and its relationship to restore optimal health. The art of the chiropractic profession is both adverse and diverse. The vast majority of methods have pursued many ways to remove a ‘subluxation’ by correcting a bone out of place. Hundreds of methods and variations on methods have evolved from 1895 that range from ‘force to no touch’ and ‘machine to by hands only’. There are many methods focused on the ‘physical position of one bone’ that measure in millimeters and ¼ degrees and a few ‘energetic systems’ that perceive that the whole body as a resonant field and measure nothing anthropometrically. The genius of the structural engineers and the genius of our energetic kabbalists in chiropractic are necessary for us to ‘balance’ our patients. It’s what makes us an alive human. It is that balance of energy and physical. It is an equation that creates a completeness that we have yet to integrate. Vitalism is balance of our energetic and our structure. We are an amazingly diverse group that has individually tried to unlock the best reduction of a bone out of place to resonate at an optimal energetic value (EV). I was taught this ‘bone out of place’ philosophy all through school. After 19 years in practice and two upper cervical board certifications, I felt that the biomechanical model of my predecessors was not incorrect but incomplete. At that moment, I made a decision to step forward just as Gregory did to Grostic and B.J. did to D.D and continue the investigation to corrective care and the subluxation. One day, I stood someone up and began to look at human being and their postural misalignment from an upper cervical chiropractic point of view. I continue to look at the relationships and the affects of deviations off vertical. The realized that the skull, C1, and neck are not the only misaligned structures, but so is everything below. It’s time to do the same. I began to look at the relationships of the atlas to the pelvis, the short leg, and the low shoulder all mixed in with the rotation of the pelvis and the shoulders. Once I started looking beyond a bone out of place I saw an alive human body that is not just a bone out of place but a flow system that had a story of many traumas, many compensation and many years of degeneration. That awareness started by looking at Figure 1 and saying ‘there is a story behind this’, and the bone out of place is a symptom of that story. Finding a vitalistic model that explains the story of the traumas, the compensations, and the collapse over time will expand our ability towards corrective predictable care. Do you see Figure 1 only as a bone out of place? Pelvic rotation, whole bending of the spine, compression of the whole spine, spinous rotation and counter rotation are at every level. The whole neck is bending and twisting and the skull is off vertical etc. I was the supposed expert and I was unable to explain Figure 1 beyond a ‘bone out of place’. I am able to explain the flow of Figure 1 and would like to share that today. I can explain it with logic and in biomechanical language that has opened a larger door about our philosophy, art and science that is beyond looking at Figure 1 as a bone out of place. Here some of the questions that helped my through to my new perception. Question 1: Is a bone out of place a big enough picture to explain Figure 1? Answer: Figure 1 demonstrates every bone out of place. There is head tilt, neck tilt & rotation, spinous rotation, and vertebral wedging are at every level. The pelvis is severely orated and the lower rib cages are significantly displaced. The human body is a closed kinetic chain. When one bone is out, every bone must be off orthogonal. Push any point on your adjusting table and the whole table moves every time. Question 2: What causes this to happen? Answer: Trauma damages the body’s soft tissue system that supports us. This is known as the myofacial envelope (MFE). The human body is subjected to multiple traumas through its life. Birth trauma, learning to walk, sports injuries and car accidents are some of the most obvious. Multiple traumas to the MFE create biomechanical postural patterns for every patient. Question 3: Is there compensation in Figure 1? This mechanism of neurological sensory ‘off vertical’ that actives the myofascial envelope modulates the skull on ‘a one of a kind articulation’ that is similar to a gyro on a gimbal. The C0/C1/C2 modulate the 12-18 lb. head over the long lever of the spine for a best mechanical leverage and postural balance system. Because C0/C1/C2 are the most superior anatomical structures, they are the also the most compensatory. The compensation by Innate Intelligence is to balance the head over the pelvis. There are three structural sections that are use by nervous system and the MFE to restore least stress and maximum energy. They are the shoulders, the neck and the skull. The simplest configuration is when the shoulders, neck, and head as a unit toward vertical. Multiple traumas can damage multiple areas of the MFE and these three can be non linear. This is visible on posture and x-ray (Nasium). 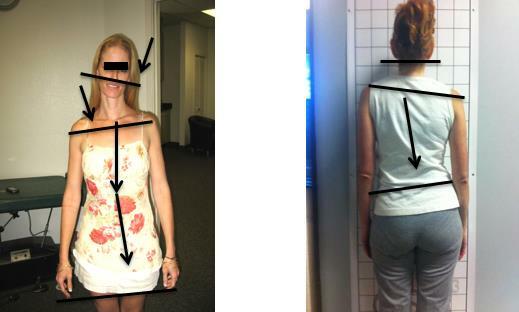 Multiple postural combinations exist when we look at our patients posture and its story. This is the relationship that BJ and Gonstead share in common. The neurological importance of the C0/C1/C2 complex as primary compensatory and the foundational structures linked through misalignment (physical) and innate intelligence (force) connecting the Triune in Chiropractic of Intelligence. Question 4: Is there a relationship to this or just a random pile of bones? Answer: Once the body has trauma, and compensation occurs, the body will create a flow pattern that rights the skull in an optimal energetic management. Postural patterns are affected by multiple traumas and multiple damage. Misalignment pattern are more difficult to stabilize when structures below are not stabilized and corrected in sequence. I tell my patients, it’s like building a snowman, and you just cant put a head on a misaligned foundation. Question 5: Has gravity and time affected Figure 1? Answer: When the MFE is damaged and weakened, the structure is weakened and cannot sustain gravitational force. Gravity is the largest stressor to the human body. Its compressive effect is visible in Figure 1. Scoliosis is a symptom of trauma, compensation and collapse. The shortening from gravity and asymmetric loading of every joint and disc spaces (OA) is explainable. The compressive effect that increases thoracic pressure and most likely primary cause of HBP is now explainable because of gravity. I repeat, the tilting and twisting of the whole human frame that creates neurologic fatigue (dis-ease) and MFE spasm (pain) is vitalistically explainable because of the relationship between complete body subluxation and gravity. The human body is manufactured to withstand the stress of gravitational attraction. It and the surrounding MFE push upward like a balloon. This biomechanical model is known as Tensegrity. Names like Buckminster Fuller, Donald Ingber MD PhD, and Thomas Myers are pioneers in this investigation. Tensegrity connects us and its collapse diminishes us. Tensegrity explains our ability to distribute large forces with structural failure because of this ‘balloon biomechanical model’. It is not until the MFE is damaged off of orthogonal that Tensegrity is compromised and begins its vertical collapse. The Tensegral collapse is visualized in the sagittal full spine as a collapsing thoracic curves (kyphosis) and cervical curve kyphosis or increased anterior translations. All of these are secondary effects to the gravitational overload on a misalignment. Tensegrity is a bridge that explains the vitalistic chiropractic and any degenerative symptomology. It is the breakdown under gravity that creates a tension-compression syndrome palpated as muscle spasms, tension bands, and repeatable postural distortion patterns. Question 6: Releasing the Tension? 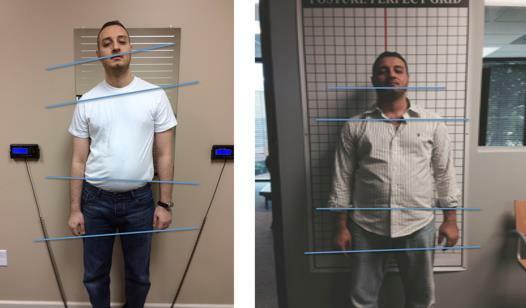 Answer: Misalignments create 3D postural distortions. It is the MFE that orchestrates a three dimensional activation of postural musculature within the MFE to maintain balance. Thomas Myers calls these ‘Anatomy Trains’. This activation of the MFE is from leg and pelvis (origin) to C5, C1 – superior nuchal line, and the skull (insertions) that create supportive tension lines (TL). These (TL) have been termed as resistant pathways by Ralph Gregory (NUCCA), as occipital fibers by Dejarnette (SOT), as fixations by Gillet, and a bump on the spine by DD Palmer. Muscle tension in the MFE is the enemy and corrective release will release everything within and encased by the MFE. It is the MFE that holds the bones out of juxtaposition as they compensate to stabilize the original trauma and support us three dimensionally. Bones do not move themselves in place or out of place. It is the tension in the myofascial envelope (MFE) that allows balanced least stressed movement when orthogonal and stability from collapse when misaligned. Figure 1 is a combination of the original trauma tension, the response by the MFE compensatory tension, and the gravitational tension. All of these tensions need to be released from the UC area, at multiple release points, with multiple headpiece placements in a sequence of events that stack the structures and neurology correctly. That is not a bone out of place. This stops the sensory input and releases the motor response to an orthogonal Tensegral posture. Posture is our business. The bone out of place is a mechanistic science in a vitalistic-based philosophy. Corrective care is not simple. It is out of balance. It takes us in the profession to ask questions and continue our lineage of greats. Now is time again to begin creating like DD, BJ, Clarence, and the Gregory’s of our past (Figure 3). Figure 1 2 or 3 are more than a bone out of place. It is an Alive system that has been traumatized, has responded, and is in a dynamic flow pattern to sustain compressive forces. We now can measure Figure 3, access the tensional relationships, release them upper cervical, and restore Orthogonality and Tensegrity over time predictably. The better we look at these relationships and increase our awareness of how postural distortions occur, the better we can begin to unravel their misalignment story. It is the natural expansive expression of the ‘Purpose of Universal Intelligence’.